A dependable horizontal band saw. The Series 13 is perfect for fast accurate, medium production operations. Some of the machines were produced with the programmable control the operator can easily program cut-off length, and number of cuts. The 10 ft. long shuttle table has a large capacity. Optional features were available on this machine. This level gauge or site glass is used on both Hydraulic and coolant tanks. It is used to maintain fluid levels. A centrifugal pump which supplies coolant to the saw blade. Also recommended is the P AB 13-DBR6-C intake screen. Limit Switch that is actuated when the saw head reaches the bottom of its travel. Multi Cycle Counter controls multiple strokes of shuttle in automatic feed mode. Predetermined Counter or Piece Counter shuts machine down after desired amounts of parts are cut in automatic mode. Timing Belt that runs between the Hydraulic pump and motor. Drive Pulley or Variable Speed Pulley located on the blade motor. Also recommended P AB 13-AD43. 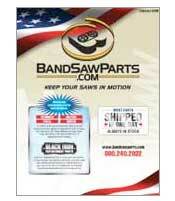 Variable Speed Belt #2322V441 or Blade Drive Belt. This Sight Glass or oil gauge helps you maintain transmission oil level. This a Ball Bearing that fits on the output shaft of the transmission on the wheel side. This output bearing has an external snap ring. This is a Ball Bearing that fits on the output shaft of the transmission. This is the small output bearing. Bronze Bushing for saw head pivot. Each machine requires two pieces(sold individually). Handle Stud for guide arm lock down. Also recommended P AB 13-BD12. Ball Knob for guide arm lock down. Also recommended P AB 13-BD11. Guide Bearing or roller bearing for Marvel PA13.